Happy Halloween Spooky Sightseers! I hope you’re not already sick of pumpkins…candy corn…cheap spider webs…etc. It is, after all, a Nebraskan’s least favorite holiday. Why? Because we don’t necessarily get along with those wearing burnt orange… But if you happen to see the BoogeyMan this Halloween, tell him he’s not as scary as our scary-low bus tours prices! We’d love to make your Thanksgiving/Christmas season even more special this year. I’m happy to say we have seats available on many of our upcoming bus tours from Nebraska! One of last years’ best sellers, Chicago Yuletide Spectacular, is set to be another unforgettable tour with the fantastic Broadway Show “A Christmas Carol” at the Goodman Theatre. The Windy City during Christmastime is unlike anything you’ve seen before, guaranteed! We also are very excited about our BRAND NEW Kentucky Christmas tour! If you’ve never been to Louisville, KY before, you’re going to be in for a treat. If there was a statistic that calculated the most fun attractions within a mile radius, they’d take the “crown”. One of our best ever bus tour for seniors. Includes three nights at the beautiful Galt House Hotel and visits to the Kentucky Derby Museum, Muhammad Ali Center, Louisville Stoneware, and Pam Tillis Dinner Show just to name a few! But hurry, time is running out. We’re expecting these to be filled within the next couple weeks! And, if this weekend you see someone out trick-or-treating dressed up as Moostash Joe, it’s probably him. 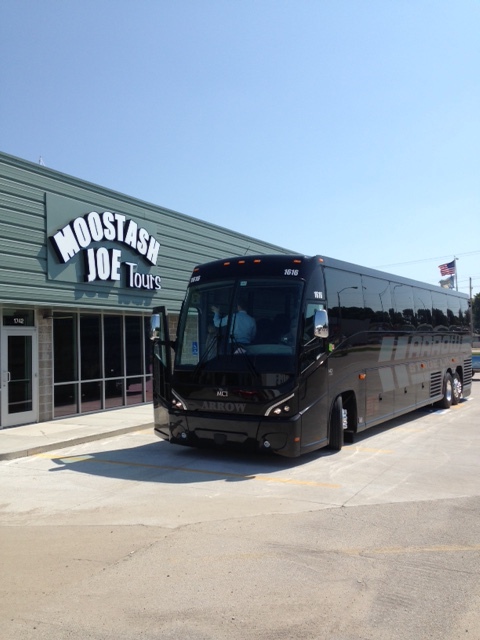 This entry was posted in Announcements and tagged bus tour for seniors, bus tours, bus tours from Nebraska on October 28, 2015 by Moostash Joe Tours. Good day friends! We have more news! Our very own, President Joey Spellerberg, was featured in the renowned online travel magazine, Leisure Group Travel. He did an exclusive one-on-one interview in the Take 5 section, which highlights tour operators and travel experts from around the country. Click the link below to read what he had to say, it is well worth the 5 minutes it is supposed to take! Next time you call in, let us know what you think! We’re trying to figure out if Joey has a future in the interview industry. Also, remind us of one of your favorite bus tours you took with us way back when. We’d love to hear about some of the memories you made with Moostash Joe Tours…..40 years seems like a pretty long time you know. This entry was posted in Announcements and tagged bus tours on October 20, 2015 by Moostash Joe Tours.